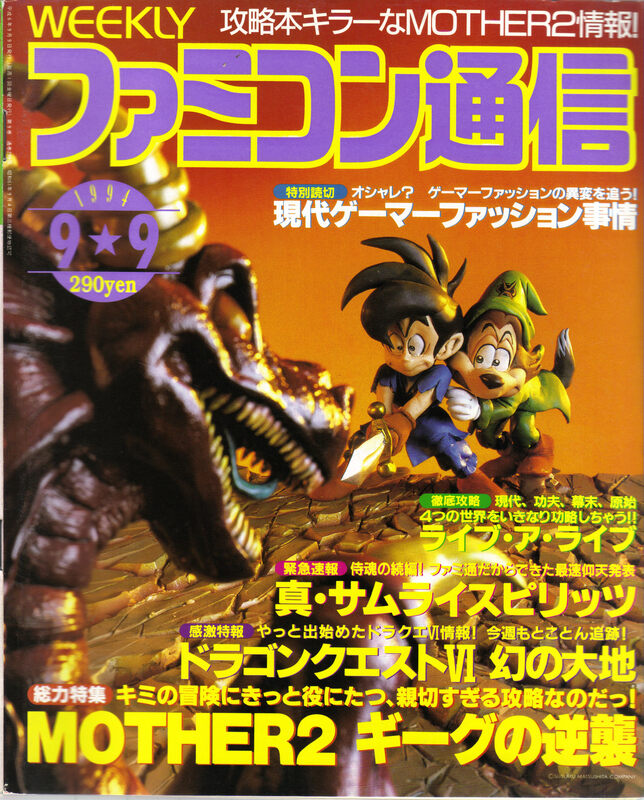 Weekly Famitsu – September 9, 1994 | Yomuka! This week’s issue introduces the MOTHER 2 Times: a weekly section in the magazine that ran for eight consecutive weeks. Its main feature was the walkthrough, but also included such things as interviews, comics, and behind-the-scenes peeks. I don’t plan on including the game walkthroughs, but I’ll continue to post any particularly interesting sections. This week’s issue highlights an interview with the two main programmers for MOTHER 2, Kouji Malta from APE and Satoru Iwata from HAL. EDIT 2/14/2012: I’ve fixed a mistranslation about “freedom”, which refers to post-programming putzing, not post-ending gameplay (see left of Iwata’s photo). A big thank you to Ice Sage for pointing it out! Kouji Malta Profile: Programmer for APE, Inc., a company run by president Shigesato Itoi, the scenario director for MOTHER 2. Malta is in charge of the data production for the game. August 26th is the day MOTHER 2: Giygas Strikes Back finally goes on sale. This week’s issue goes on sale August 25th. That makes this the day before release! For those who are excited to head out and buy the game, we’ve asked the two programming directors of MOTHER 2 about the trials and highlights of making the game. The directors are Iwata from HAL Laboratory and Malta from APE. MOTHER 2 was actually made through the cooperation of those two companies with Nintendo. — Was it HAL or APE that handled most of the work developing the game? Iwata APE had more people working on it. We [HAL] worked on some of the overall system, but maps and scenarios take a lot more work than the system when it comes to RPGs. Malta Yeah. So in that sense you could say it was a bit more work for us [APE]. Malta We’d basically camp out there for a week at a time. Iwata Our company has a meeting room with a view of Mt. Fuji through the glass panels, and that was the room that practically turned into a separate branch office for APE. — So it was produced in a room with a view of Mt. Fuji? That must have felt great. Malta Yeah. We’d talk about how great it’d be to have an office in a place like that. Iwata A beautiful place like that is a good location for creating something, but life in the city is a lot more convenient. — When was the camp-out you’re talking about? Iwata It was from fall of last year  until spring of this year  that they were coming to our office regularly. — Of course Itoi would go too, as the scenario director? — Did people mooch him for autographs? — When did the game come together as a completed product? Satoru Iwata Profile: President of HAL Laboratory. Programming Director for MOTHER 2, constructed overall gaming system. According to Itoi, Iwata is the superman who delivered the game to completion. Iwata Around mid-April is when we more-or-less had an RPG that wouldn’t embarrass us if we released it. But we’d already made everyone wait so long for it that we wanted to really see it through to the end, so we spent the next three months perfecting it. We originally thought it’d be ready in two months, though. (laughs) The standards really shot up during those last three months, so as a creator, the feeling of accomplishment changed. — I hear it turned out like the previous game, with how much freedom you had after the main programming was all ready. Did that make you devote even more attention to those parts? Malta We did. It was amazing, like a game for us in its own right. So there were some major final enrichments during those three months. We hadn’t yet done a full run-through by the time MOTHER 2 finally took shape, so we played it together as a staff. Then we found some places that weren’t going to work, so we made sure to polish it all up. Iwata There’d be a spot that we joked about how it’d be better in such-and-such a way and then two months later be set that way. I feel the staff made the game without compromising. Malta The slot machine in the desert is a perfect example. Iwata It’s pretty far into the game, but there’s a slot machine just plopped right in the desert. We thought it’d be neat if the slots were actually playable, so we made it work. Malta And to top it off, it’s not that there’s a working machine—there are men in the shape of a slot machine who move around. That’s the kind of playful imagination you’ll find in the game. — Isn’t it hard to program the system to add things like that after the fact? — What specific parts gave you a hard time? Malta I’d say the delivery man. Iwata There’s a special system for a delivery man in the game. One comes to bring you items you weren’t able to carry before, and one is a pizza delivery man. This is something that has to reach the player at any stage in the game. It was a really reckless idea—the delivery man can’t just pass through walls that the player can’t walk through, so we had to make him able to navigate the map for himself. Malta But the player had been able to play around and run away as soon as the delivery man appeared. Asato Izumi: Columnist recently breaking out into novel-writing. Writes often about video games. I think the charm of the first MOTHER lies in its “Joe Blow” variety of everyday life and the seasons, like riding the train between towns and arriving at a cold town to see everyone sneezing. (The background music by Keiichi Suzuki had a nostalgic feel to it and provided an excellent touch.) I look forward to seeing how MOTHER 2 delivers the “flavor” of the game outside of simple fights and problem-solving. Congratulations to Shigesato Itoi and all the staff on the completion of MOTHER 2. A long time ago, I sent you the cassette tape of the dramatization of the MOTHER novel. The woman who played the voice of Loid said she was really looking forward to the new game, too. I’ll do my best to have the MOTHER 2 novel published by the end of the year. I look forward to working together again someday! Saori Kumi: Novelist and writer of the MOTHER novel. As stated in her passage, will publish the MOTHER 2 novel. Rika Kayama: Psychiatrist with the famous column "Eyedrops for Your Backside and Suppositories for Your Eyes". Said to be looking forward to playing MOTHER 2. I’m so glad that no matter how much time it took, MOTHER 2 is coming out as promised. There’s a feel of adult responsibility and pride in that. I’m sure the involved parties feel as relieved as if they had a bone caught in their throat and finally got it out. Even Star Wars claimed to have nine stories to release over 27 years, but all this time and we’ve only got three. In that regard, Nintendo and Itoi really did a great job. Do you have excerpts for the magazine from the week before? September 2, 1994? It’s the one mentioned in the Wikipedia Earthbound article.